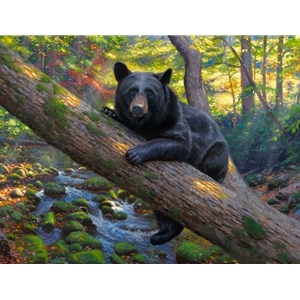 The magnificent Smoky Mountain Black Bear - powerful - yet peaceful. Perched on his reclining branch, he is a testament to creation's desire and ability to rest and be at ease. The "bear necessities" of life are all around him, and he doesn't worry a moment about what tomorrow holds. Gaze into his eyes as they follow you around the room and ponder the mystery of being provided for by the Creator who cares for you. "Be anxious for nothing, but in everything by prayer and supplication with thanksgiving let your requests be made known to God.